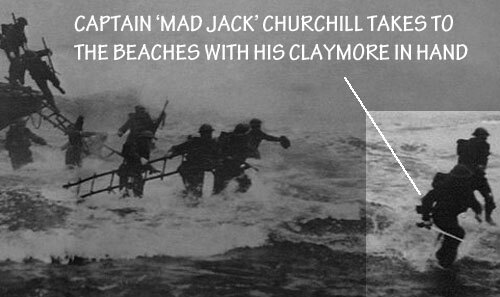 “Mad Jack” Churchill Who Attacked the Germans with a Broadsword and a Longbow! Lieutenant Colonel “Mad Jack” Churchill was a British war hero known for his use of a sword in battle, with which he claimed the defeat of at least 42 Germans in WWII. Aside from his trusty Claybeg sword, he was also proficient with a bow and arrow, having been the last British soldier in history to record a kill with such a weapon. Now, the Norwegian Royal Explorers Club has compiled a book which features writings on Mad Jack, whom they consider to be among the greatest of adventurers throughout all of history. Mad Jack firmly believed that every soldier should have a sword. This is the sort of belief that the Explorers Club felt made him a prime candidate for their compilation. Not only did he embody a dashing spirit of adventure, but he used this to a true advantage, having saved literally hundreds of lives through his efforts in Jerusalem. Founder of the club, Espen Lazarus, considers the Lieutenant Colonel to be a true inspiration due to his undying passion and his abilities as a leader, who used his skill to train others in combat. Aside from his sword and his bow, Mad Jack was also a fan of the bagpipes, using them to excite his troops. The winner of a Military Cross and two Distinguished Service Orders, he set his record as the last soldier to record a kill with his bow while defending a small village in France. While the battle was ultimately won with heavy weaponry, his bow kill was the first kill of the battle. He was a man who continued fighting when injured, having been wounded only recently before the defeat of over forty Germans in Italy. During the battle, he used only his sword. It was not long after, however, that he was imprisoned in an internment camp. Due to his rank, Mad Jack easily could have evaded capture by staying in the back lines, but that was not the sort of fighter he was. He escaped, only to be captured again, upon which he made yet another escape. A few years later, he saved the lives of 500 during the 1948 mass-murder of the Hadassah medical convoy, the Mail Online reports. While hard for some to believe given his exploits, Mad Jack was known for one other trait besides his daring: his modesty. Up to the point of his death in 1996, he was never heard sharing war stories unless requested to do so. He simply cared for the good of his troops and the good of those he saved, and even his own son remembers Mad Jack as a modest man who could have easily written the book on himself yet chose to quietly live out his days as one of the greatest heroes WWII would ever know.